There has been a lot of press lately about studies like the Harmony Project and the impact of music on our brains. In the face of repeated funding cuts, we are finally finding fuel to argue for music’s importance in the schools that goes beyond providing job security for classical musicians and big-shot conductors. Yes, science once again comes to our aid in providing proof for something most of us have intuitively known. It turns out that when kids learn to play an instrument they are in fact setting themselves up for success for the rest of their lives. 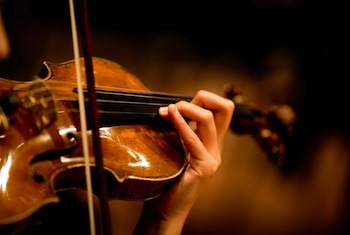 Not only does playing music require the joint effort of all regions of the brain, it also teaches valuable skills like focus, discipline, communication, and collaboration. But the real kicker is that this activity actually causes the physical structure of the brain to form stronger neural pathways – which has been shown to increase brain function well into adulthood, even when playing an instrument is no longer part of the picture. Yes, you heard it here. If your kids play an instrument they will be smarter adults. And, these studies are finding that this kind of musical education can even counteract the effects of the income gap in education. So, forget the vitamins. Bring on the violins!! !